Thermo Ripped is an intense fat burning metabolite from Balance which will assist you to shed that unwanted body fat. 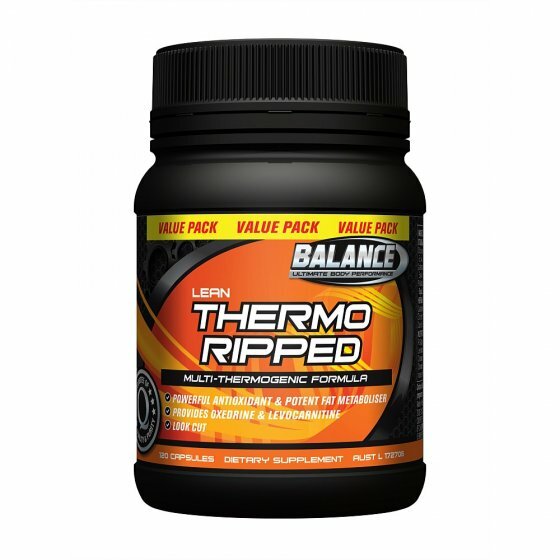 Balance Thermo Ripped is ideal for those serious about building lean hard muscle and can be used during training prior to competition. Balance Thermo Ripped is an effective energy enhancer and fat burning formula with 11 powerful ingredients. Ingredients: 50mg of Caffeine per capsule. Do not use during pregnancy or breastfeeding without medical advice. Directions: Adults Only: Take 1-2 capsules before a meal, up to three times daily as required with a full glass of water, or as directed by your healthcare professional. Do not exceed this stated dose.